Furnace Design & Construction — Frazier Simplex Engineers and Machine Co.
Frazier-Simplex, Inc. is a world-wide recognized leader in engineering to the glass industry, and has been for nearly a century. This is a history filled with designs and construction using the latest technology. 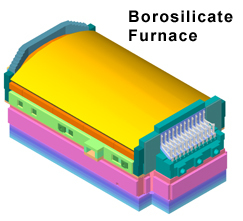 Our furnaces are considered among the most efficient in the world, producing excellent glass quality. Whether you are enjoying anything from your favorite bourbon or working in the pharmaceutical industry, chances are it has been made with the help of Frazier-Simplex. Our designs utilize state of the art materials in conjunction with tried and trusted construction techniques. Computer aided heat balances allow use of conventional firing with or without electric boosting to produce very efficient furnaces with high turndown ratios. Along with our more traditional designs we also supply custom design furnaces for specialty glasses and other high heat applications.